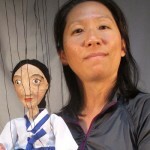 Bonnie Kim received her Master of Fine Arts degree in Theatre from University of Hawaii at Manoa, focusing on arts education with puppetry, masks and movement. She has worked with Bread and Puppet Theater, internationally renowned for their giant puppets and masks. Her performances with giant puppets and masks have been showcased in Hawaii, Vermont, Korea and Cambodia. Her passion for puppetry has led her to study and create various types of puppetry work not only with giant puppets and masks but also with hand puppets, Czech marionettes and shadow puppets in the United States and Europe. Her most recent puppet show, “Long Long Ago, When Tiger Smoked: Animal Tales from Korea”, has been performed in Hawaii and Germany. As a teaching artist, she has been teaching drama, puppetry, masks, creative dance and recycle art to children and adults for many arts organizations in Hawaii, including Alliance for Drama Education, Bare & Core Expression, Big Island Dance Council, Hawaii Community College, Hilo Community Players, Recycle Hawaii and Society for Kona’s Education & Art. She is one of the professional teaching artists on Artistic Teaching Partner roster with the Hawaii State Foundation on Culture and the Arts for its Arts Education Program. She is also one of the artists for the Statewide Cultural Extension Program with University of Hawaii at Manoa Outreach College.